Austin, Texas has emerged as one of the hottest cities in the country over the past several years. The biggest hipster outpost west of Brooklyn, N.Y., it is also the choice of countless up-and-coming and already established chefs, musicians (Willie Nelson and Sheryl Crow), artists (director Robert Rodriguez), athletes (Lance Armstrong) and especially golfers, from recreational players to PGA Tour and Champions Tour members like Tom Kite and Tim Petrovic. The appeals are many. Austin is a very lively and culturally rich small city (or a big college town), heavily influenced by the largest urban campus in the United States, the University of Texas, with nearly 60,000 students and its famous Longhorns logo and signature orange color. Austin is a sea of unique, independently owned stores and restaurants, from the omnipresent bicycle, music and cowboy boot shops to second-hand boutiques and art galleries. Downtown's only "big box" retailer is Whole Foods Market, and it started here, with an immense flagship store that is a top tourist attraction. Largely as a result of the university, the music industry and the many high-tech businesses based here, Austin is an island of liberalism in an otherwise conservative state, and Austinites are often known to remark that their city is unlike any other in Texas -- hence its unofficial motto, "Keep Austin Weird." Also known as, "The Live Music Capital of the World," Austin has the most performances per capita of any city in the nation, plus two massive annual music festivals, Austin City Limits and South by Southwest. It is also one of the planet's epicenters of high quality barbecue. Most people looking at second-home or retirement real estate choose to live outside the city, however, since the famed Texas Hill Country surrounds Austin. Again, this is an anomaly for the otherwise largely flat and barren geography of the Lone Star State, a region of rolling, rugged hills caused by the Llano Uplift, one of the largest granite formations in North America. Dotted with small-town charm, natural beauty and fair weather, the region has become one of the most popular retirement, vacation and second-home areas in the nation. And because the temperature is often hot, those who can afford to usually choose to live on one of the many popular lakes in the area. For golfers, no area is more popular than the 21-mile stretch at Lake LBJ. Manmade by dams on the Colorado River, it is perfectly suited for swimming, fishing and all motorized and non-motorized watersports. Horseshoe Bay is the course-rich section of the lake, home to the Horseshoe Bay Resort, the only one with three Robert Trent Jones Sr. courses. 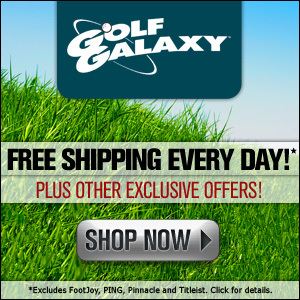 Nearby is the region's premier private golf community, Escondido. Spanning 550 lakefront acres, Escondido has a private Tom Fazio course, an extensive lake club, club-owned watercraft available to members, a golf performance center, a 30,000-square-foot clubhouse with wellness center and dining, and even a private cigar lounge. Upcoming additions include a European spa and tennis courts. 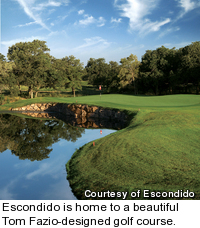 Escondido's golf course is a par 71 that plays from 5,224-7,168 yards from four sets of tees. It fits beautifully with the Hill Country landscape, with rolling terrain, natural waterways and dense stands of Texas' famed live oak trees. Surprisingly for such a hot region, the course boasts the best-available putting surfaces (bentgrass greens) that are kept perfectly conditioned with an underground sub-air cooling system. 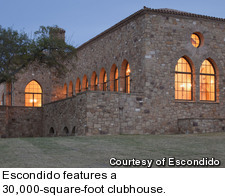 Escondido's real estate plans include 380 residences comprising three options. Home sites are available for custom building. Each features lake, golf course or Hill Country views, ranging from one-third to one-half acre, and are priced from $135,000- $995,000. The community also has a separate gated subdivision called Lago Escondido, a private peninsula jutting into Lake LBJ at its highest point, producing spectacular views. This is the most unique real estate opportunity here. It's a five-minute boat ride from the rest of "mainland" Escondido. Within this gated community are 38 larger estate home sites, including 24 that have private direct lake access. 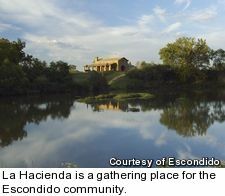 Lago Escondido home sites run from $450,000-$1.9 million. Finally, there are finished architect-designed luxury homes in several categories (such as estate, villa or casita properties), mainly depending on their location. There are currently 10 available for sale, priced from $1.1 million-$3.7 million. The club is also developing a fractional ownership product called "club residences" with four guaranteed weeks. 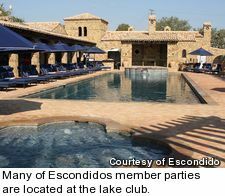 Escondido has been open for about a decade, but a new ownership group took over a year ago and is investing in the new spa and tennis facilities. The club has about 350 members and is about an hour from the city.